When Lightroom Mobile began, photos were automatically cleared from Adobe’s server whenever you removed them from a synced collection or when you stopped syncing the collection. I liked that clarity. If a photo was in a synced collection, it was on Lightroom Mobile. If it wasn’t, it wasn’t. Sadly, sometime last year Adobe changed things. I’m not sure why, but photos now remain on Adobe’s server unless you remove them from “All Synced Photographs”. In one sense this doesn’t matter. This web space is unlimited, and it doesn’t really make it any harder to find pictures on mobile devices or in Lightroom on the Web. Still, many of us don’t like to clutter up our online library with photos that we no longer want on Adobe’s server. The way to remove them from Lightroom Mobile is to remove them from “All Synced Photographs”. Easy enough? Unfortunately it’s not so easy to identify which pictures are in synced collections, and which aren’t. So how can we find them? Add a single criterion Collection Name / Contains / a e i o u (or whole alphabet). If you get a dialog box about removing photos from collections, you’ve done something wrong. Cancel and repeat the above steps more carefully. Genius! A problem that I have been wrestling with for ages. Such an easy fix. THANK YOU! Doesn’t this method still leave synced any photos which are in a unsynced collection? Yes that’s what I’m finding! I observe the same behaviour. Has anyone found a solution to this problem? So far as I see, there is zero way to keep adobe from TAKING our photos now. 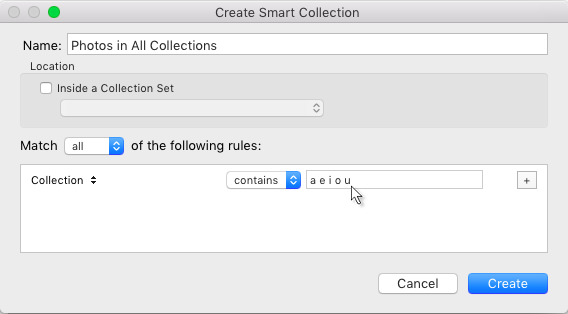 Every time I make any collection, even after doing this exercise several time, it always calls EVERY collection I try to make a SYNC collection. Sorry, this just tells me Adobe wants customers to have no choice but to let them have all our photos for free. Detest this firm more every time I have to use these products. Looking for (and found one) to replace this stuff. Great tip. You can also avoid inverting the selection if you define your collection as ‘doesn’t contain’ a e i o u. Try it out — it will only show photos that are not in any collection. This doesn’t actually work the same way, if you have collections that aren’t synced to the cloud (which is the issue). If you have photos in a collection that is synchronized to the cloud, and then unsync that collection, those photos return a FALSE to the search (they are in a collection with a/e/i/o/u), but still need to be removed from the cloud. The search for “any collection” necessarily includes the subset of collections still synchronized to the cloud, so by searching for those and then inverting you identify the photos stored on the cloud but not in a collection.